Eva’s Village is the most comprehensive anti-poverty organization in New Jersey. 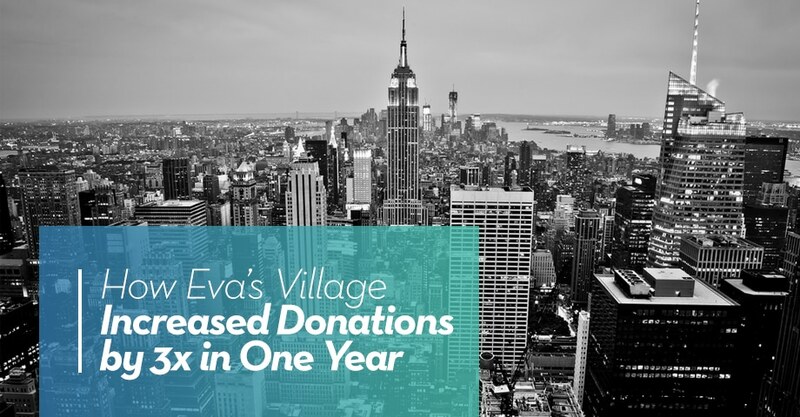 Just 18 miles outside of New York City, Eva’s Village is positioned perfectly to help those in need. In addition to meals and housing, the nonprofit provides culinary classes, education and job training, treatment for addiction and mental illness, medical assistance, programs for parents, and much more. While the nonprofit thrives today with nearly 200 employees and over 3,000 volunteers, and provides 1,200 meals per day, it started out serving Paterson’s poor hot dogs and beans in 1982. Joey Mazza, Special Events Manager at Eva’s Village, experienced the power of the nonprofit personally nearly three decades ago and has been on staff for the past 28 years. Joey’s tenure has allowed him to witness incredible growth and changes, thanks to the evolution of technology and fundraising practices. Eva’s Village hosts several fundraising events each year. The annual benefit gala called “Visions of Hope”, is the nonprofit’s most important event. Each year, the gala raises approximately $600k to support Eva’s programs. Since 2010, Eva’s Village has partnered with OneCause mobile bidding to power its mobile fundraising. Over the course of 8 galas, the event averages 94% of bids to item value, raised over $350,000 in silent auction proceeds, and increased donations 354% from 2010 to 2018. Great results and a great foundation for success! In addition to the gala, Eva’s Village also hosts a fashion show, casino night, and an annual golf tournament, which on its own raises about $300k each year. In 2018, Joey believed the golf tournament specifically could benefit from a new approach that would also replace the manual way they previously collected cash and checks. In today’s mobile-powered world, Joey saw an opportunity to fully leverage another OneCause solution to cater to Eva’s Village’s donors and to help the nonprofit stand out in the crowded NJ nonprofit scene. Joey and the Eva’s Village team decided to use OneCause DIY Mobile Bidding, to set up mobile bidding and mobile donations themselves, and easily manage the registration and check-out process. June 18th, 2018, marked Eva’s Village golf tournament. In years prior, the nonprofit used pastel beach buckets to collect cash and check donations to fund summer programs for children living at Eva’s Village, like trips to Broadway, museums, and for overhead costs like chaperones and bus rentals. In 2017, Eva’s Village raised $7,726 with the bucket method. But in 2018, using OneCause fundraising solutions, the nonprofit brought in $21,764, an increase over 3X from the year prior! What was the difference maker? DIY mobile bidding. The automated platform allowed donors to easily contribute without the need to carry cash or check (a major win for tech-forward New Yorkers!). Fast, easy, and seamless giving engaged the nonprofit’s supporters and helped them raise above and beyond their goal. Because today’s donors are always-connected and on-the-go, mobile fundraising allowed them to use the device they already had in their hand: their smartphone. Eva’s Village has a fashion show coming up later this year, which is attended by nearly 400 people. Last year, Joey and his team placed gold bowls in the middle of each table for attendees to donate cash or checks to fund programs. But thanks to the nonprofit’s golf tournament success, Joey’s team wants to put the power of DIY mobile bidding process to work at the nonprofit’s fashion show.